Barack Hussein Obama proposed to the American people that we “redistribute the wealth” by taxing all people who make over $250,000 a year and up. To many that sounds good. We should do that, so everyone is equal and has the same. That dear truthseeker is called Socialism. Everyone making the same and receiving the same salary. There is no incentive for a person to work hard, for a business to grow. This was tried by the Soviet Union, its satellites and China. They all came to the realization that without incentives, an economy cannot grow and people become discontent. After 4 years of an Obama economy will we be better off? If he actually is able to impose his ideas on the American economy, we will be in big economic trouble. After 4 years of Obama’s economic policy there will be at least 25% unemployment. With at least 10% of small businesses gone, those workers will be on the Obama welfare programs or forced into jobs in his National Civilian Police Force. For 80% of all businesses are small businesses. Most of those businesses make over $250,000 a year in profit. That money doesn’t just go into the boss’ pocket. It goes for new equipment and jobs. Take away the profit, and business cannot grow. After 4 years of Obama’s economic policy the stock market will have dived to the lowest levels since 1929. With massive unemployment and the loss of many businesses, larger companies are having a harder time selling their goods. With the tax rate at higher levels, the price of American goods have gone sky high. Companies cannot make a profit and their dividends to their stock holders have stopped. After 4 years of Obama’s economic policy, banks will still be in trouble. By not allowing banks to sink or swim, Obama’s policy of bailing out the banks will cost more and more money as more and more banks step up to the Federal Gravy Train. As they gain more and more Federal funds, they dry up credit and loans to business and people. They are sitting pretty, and with just the hint that they might go under, the Congress will throw funds at him. After 4 years of Obama’s economic policy, we will be $10 trillion in debt. With less and less tax money coming in and the costs of Obama’s welfare programs rising higher and higher, we will have to go deeper and deeper into debt. We will borrow trillions of dollars just to pay for it all. After 4 years of Obama’s economic policy, we will be in a Depression. And when our economy collapses, the world’s will collapse after us. The whole world will be in dire straits. China will discover that they cannot sell their goods in the US, since nobody has the money to buy them. Europe won’t have the funds to buy any foreign goods. And with such an economic disaster, war could break out very easily. After 4 years under Obama will we be better off than we are now? No. Obama will have taken the United States from the position of the World’s Leader and will turn us into a Third World Nation. Barack Hussein Obama is naive at best. He is wrong choice for President. His policies are so far to the left that you can call him a Socialist, not just a liberal. He will destroy all that we have worked for and hope for. Once upon a time, in a land called the United States, people would try and buy a home. They would save for years and keep their credit clean. They would look through out the neighborhood for a home they would like to buy. Then they would hope and pray that their local bank would grant them the all important mortgage. When the bank would grant this wondrous gift, they would rejoice and move into their new home. But this gift of mortgage came with a price. They had to pay it back to the bank. A payment to be made on the 1st of each month, over the course of 30 years. The people did not mind paying the mortgage. It was not as much as the rent they had been paying. The nation was in good shape when this was done. Then in 1977 a strange thing happened. Jimmy Carter, then the President of the United States, convinced the members of Congress (the people who make the laws) to pass the Community Reinvestment Act. This Act gave birth to 2 children: Fanny Mae and Freddie Mac. This Act was a good idea, for it gave the gift of mortgage to more people, in neighborhoods in which the banks originally gave a redline to. As long as the people had good credit and some savings, the bank would give them a mortgage and the nation was in good shape. Then one day in 1995, a new President by the name of Bill Clinton decided that although the Community Reinvestment Act was good, it needed to become better, to let more people buy a home. So he changed the Act so everybody could buy a home. This should have been a good thing, but it was the worst thing that could have been done. For no longer would the people have to have good credit and savings to get the gift of mortgage. They could have no savings, bad credit and still get this marvelous gift. And no longer would the gift of mortgage be fixed at a special rate. It would be variable and be able to climb to any rate the bank wanted. These special mortgages were called Subprime and allowed the banks to make a lot of money on their mortgages. And the people rejoiced and everyone went out to buy their home. But a strange thing started to happen. Homes that once were $60,000 or $70,000 were now being sold for $250,000, $400,000 or even $500,000. Builders started to build new homes and selling them for more than they were actually worth. But the people would scream “We want this house!” and the bank would give them the gift of mortgage. But not all was right. A new President, George W. Bush, saw that this could become a problem. People with low incomes buying homes they really could not afford. And he tried to make it better. In the year 2003 he tried to move governmental supervision of Fanny Mae and Freddie Mac to a new agency created within the Department of the Treasury. But the evil Democrats who ruled the Congress said, NO! Again voices were raised that Fannie Mae and Freddie Mac were not well. They tried to sound the alarm in the year of 2005. A group of Senators from the Congress, headed by John McCain, tried to heal the 2 children, but to no avail. For the evil Democrats said NO! IT WOULD HURT THE POOR. So nothing again was done. Then came the bad year, 2007. What was warned about started to happen. The people who didn’t have the good credit or the savings found that their gift of mortgage was not a very good gift. The payment that they owed each month was getting bigger and bigger, while their paycheck was getting smaller and smaller. And when they could not pay their mortgage to the bank, the bank took their house away. This was happening to many people who cried to their President and Congress for help. But what did their Congress do? They just laughed. For Fanny and Freddie were sneaky children. They would give their friends in Congress many gifts and presents. Gifts of special mortgages (that the poor people could never get) and gifts of money. Some got many gifts. Dodd of Connecticut got $133,900, Obama of Illinois got $105,849, Pelosi of California got $32,750. And they did nothing for they wanted more gifts. And then the crash came, August of 2008. The banks started failing and there was no one to give the gift of mortgage. For Fanny and Freddie were very, very ill. They couldn’t save the banks or even themselves. And the Congress finally had to do something before they would die. But what did they do? They gave them more money. $700 trillion of the people’s money they would give. It would help save the 2 children and give the banks a chance to live. But them people who knew how the banks should have worked said please don’t do this, it will do more harm than good. To give such a sum without government oversite, would only create the same conditions we now face. So nothing is being done, and banks are failing. The people are still losing their homes, and all we get is the evil Democrats crying: IT’S JOHN MCCAIN’S FAULT! If you have like this little tale feel free to cross post it, just give me a link back to my site. The Difference in Leadership and Making a Speech! There is a major difference between the 2 candidates, John McCain and Barack Hussein Obama. A very big difference. LEADERSHIP. It takes a very strong man to walk away from an election or to suspend his campaigning this close to Election Day. But again we see the character of the 2 men. 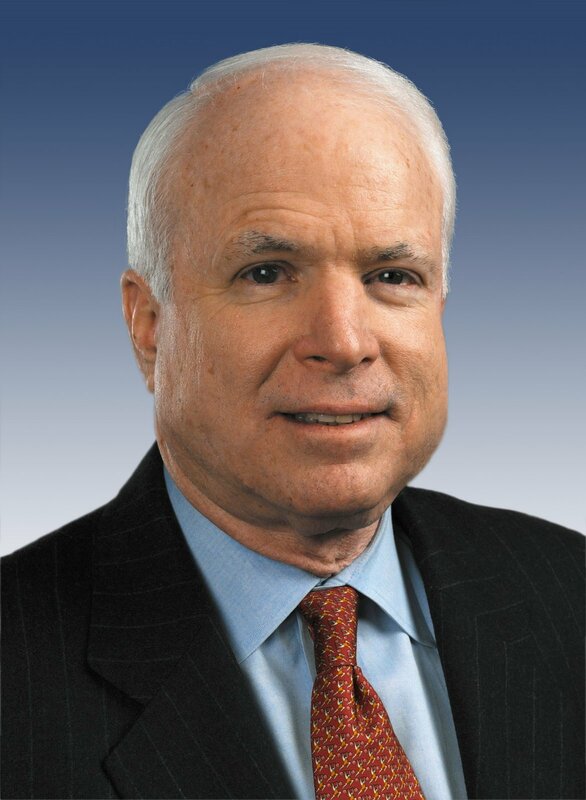 For John McCain has suspended his campaign in order to work on this economic crises that this nation is facing. The Arizona senator called on his Democratic rival, Barack Obama, to do the same. He also urged organizers of Friday’s presidential debate at the University of Mississippi to postpone the event. There was no immediate response from the Obama campaign. Knowing Senator Obama and his people, they will call this a publicity stunt and continue to make speeches. This is not the time of speech making or rhetoric. It is the time for both parties to sit down and come up with real solutions to this problem. This is not the time for casting blame on each other. It is the time for a bi-partisan effort to fix this mess. This is the time for a leader to arise and take charge. And he has. It is John McCain. A man who would give up a chance for the White House in order to save his nation. A true American Patriot. A man worthy of your vote. Filed under: Barack Hussein Obama, John McCain, US economy, US elections |	Comments Off on The Difference in Leadership and Making a Speech! How Obama will spend your hard earned tax dollars. With the problems with the US economy and crippling debt to the nation, instead of finding ways to cut our costs, Barack Hussein Obama proposes more wasteful spending. This time it is to the United Nations Development Program. Why should the United States have to be responsible for problems of poverty around the world? According to Senator Obama and the Democratic Leadership, there is a great amount of poverty here in the US. Shouldn’t we deal with our own problems first? Why not ask those nice rich Saudis to foot the bill for this one, or the Iranians, or the Venezuelans, or the nice rich emir of Dubai? They have plenty of money lying around to finance many mosques, terror groups, etc. They should be footing this bill instead of us. To give more money to the UN Development Program is like flushing it down the toilet. It is a cesspool of corruption and greed. Nearly 18 months after the United Nations Development Program promised to shed daylight on its internal operations to the countries that pay its bills, is the U.N.’s flagship anti-poverty agency going to live up to the deal? That is one of the main issues in a tussle currently taking place within UNDP’s 37-member executive board, which supervises the organization, and which winds up its semi-annual meeting today in New York. The battle is led by the U.S. and a number of other Western nations that pay most of the UNDP’s bills (the U.S. alone donates roughly $500 million annually to UNDP). Some of the Western states are concerned that UNDP is still trying to keep its $5 billion operations — and any problems it has with them — under as many wraps as possible. For its part, UNDP says it is happy to cooperate if only all the countries that make up its board can agree. The outcome of the battle is still uncertain. The issue revolves in part around UNDP’s disclosure of its internal audits to U.N. members that request them — a policy that became a hot button a year ago, when the U.S. demanded to look at UNDP audits for North Korea. The audits, conducted periodically of all UNDP programs, examine how the organization is spending its money and whether it is following its own rules while doing so. Traditionally, UNDP’s top managers have considered them to be “management tools,” and insisted they be kept confidential, even from the governing executive board. But all that began to change in 2007, when U.S. diplomats got to examine a series of UNDP audits of its programs in North Korea. After reading them the U.S. accused UNDP of funneling millions of dollars in hard currency to the Kim regime, hiring North Korean government employees to fill sensitive UNDP jobs in the country, and passing on sensitive “dual use” technology that could be used in North Korea’s nuclear program, all in violation of U.N. rules. Moreover, UNDP auditors had passed on many of those concerns to top management; nothing was done. The essence of the U.S. charges was vindicated, and then some, in a special investigation of UNDP’s operations in North Korea, which reported in June of this year. The lengthy document not only buttressed most of the U.S. charges, but also reported that a North Korean government employee who served as UNDP’s finance officer also verified the receipt of the checks she wrote, in violation of one of UNDP’s most fundamental anti-fraud rules. Fraud, mismanagement, greed is just some of the words to describe the UN in general the its Development Program exactly. Yet Senator Obama will just throw them more and more of our taxpayer money. This is just one more Communist idea from the closet communist. It is bad for the US and the American taxpayer in general. And just another reason not to vote for Barack Hussein Obama in November! Filed under: Barack Hussein Obama, US economy, US elections |	Comments Off on How Obama will spend your hard earned tax dollars.